Kentucky Gov. 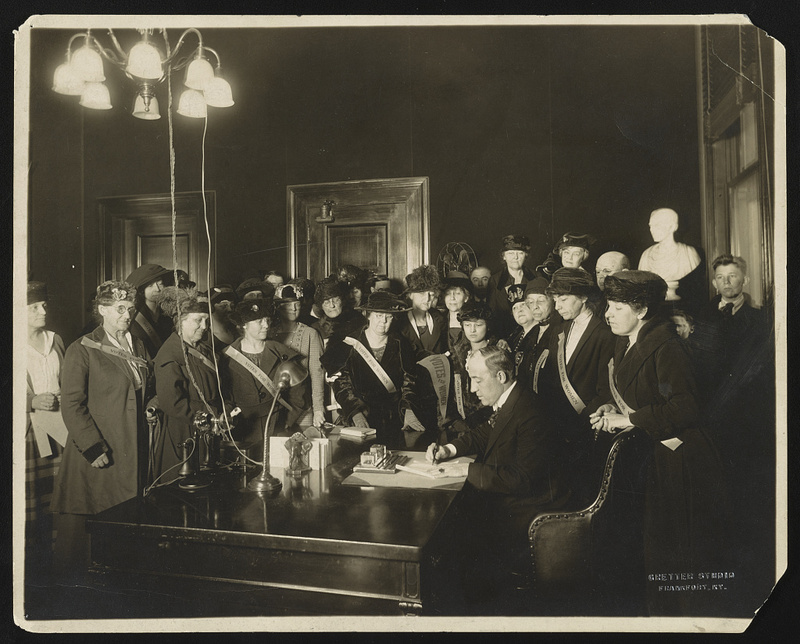 Edwin P. Morrow signed a resolution ratifying the 19th Amendment in January 1920. Kentucky was the 24th state to pass the amendment. August 26 was Women’s Equality Day. It’s the day in 1920 that the 19th Amendment to the U.S. Constitution was formally adopted, giving women the right to vote. It was finally fully ratified eight days earlier when Tennessee became the 36th state to ratify the constitutional amendment, giving it the needed three-fourths of all states. August 26 is also the day designated by Congress in 1971 to commemorate American women getting their voting rights. We already know that 2018 is turning into the Year of the Woman in electoral politics, specifically, the Year of the Democratic Woman, as Democratic women across the country rack up primary victories (and at much higher rates than Republican women). There will be a record number of women on the ballot in November, in races for governor, for House seats, and for state legislative seats. Multiple polls show that the gender gap of Democratic-voting women and Republican-voting men is sizing up to be one of the biggest ever, likely even record-breaking, with one poll showing the gap at 24 points, according to FiveThirtyEight.com. Why is that so important? Because women outvote men. Even though universal women’s suffrage has only been around for less than 100 years, women have cast more votes than men in every election since 1964. Women make up more than one-half of the U.S. population, and they have cast between 4 million and 7 million more votes than men in recent elections. “In every presidential election since 1980, the proportion of eligible female adults who voted has exceeded the proportion of eligible male adults who voted,” according to research by the Center for American Women and Politics at Rutgers University. Women’s higher voting totals also hold up during midterm elections. In addition, more women than men are registered to vote. So: More women running, more women voting, more women voting for women, and more women voting for Democrats. It all adds up to a Blue Wave come Nov. 6. Some history: The women’s rights and women’s suffrage movement started in Seneca Falls, New York, in 1848, although the suffrage movement didn’t really take off until after the Civil War. A constitutional amendment giving women the right to vote was first introduced in 1878. Obviously, passing voting rights for women took a while. Of course, there are some caveats about the 19th Amendment. While it gave all women the right to vote in 1920, that obviously applied only to white women. It would take decades to remove barriers to voting such as Jim Crow laws, poll taxes, and other impediments, and today’s voter suppression tactics and voter ID laws still seek to limit voting by minorities. But back in 1920, some states were ahead of the game in giving women the right to vote: A full 15 states granted voting rights for women before passage of the 19th Amendment, mostly in the American West. Five areas gave women voting rights while they were still territories. Twelve states allowed women to vote in presidential contests (but only in presidential contests) before the 1920 election. Much of the country’s attitude toward women voting changed during World War I, as women took on more important roles at home while some men were fighting overseas. This is from an editorial from Hearst Newspapers, written by Arthur Brisbane, a leading and influential newspaper editor and syndicated columnist in the early 20th century (his grandson, also named Arthur Brisbane, was public editor of The New York Times from 2010 through 2012). The editorial, reprinted by ThoughtCo. in 2017, is undated but is thought to have run in 1917, during the time that women suffragists were actively working for voting rights, as they had been throughout the decade. The woman who votes becomes an important factor in life, for a double reason. In the first place, when a woman votes the candidate must take care that his conduct and record meet with a good woman’s approval, and this makes better men of the candidates. When women shall vote, the political influence of the good men in the community will be greatly increased. There is no doubt whatever that women, in their voting, will be influenced by the men whom they know. But there is also no doubt that they will be influenced by the GOOD men whom they know. Men can deceive each other much more easily than they can deceive women — the latter being providentially provided with the X-ray of intuitional perception. The blustering politician, preaching what he does not practise, may hold forth on the street corner or in a saloon, and influence the votes of others as worthless as himself. But among women his home life will more than offset his political influence. The bad husband may occasionally get the vote of a deluded or frightened wife, but he will surely lose the votes of the wives and daughters next door. Voting by women will improve humanity, because IT WILL COMPEL MEN TO SEEK AND EARN THE APPROVAL OF WOMEN. “Voting by women will improve humanity, because it will compel men to seek and earn the approval of women.” I like the thinking behind that. Of course, Arthur Brisbane never counted on a candidate like Donald Trump. The League of Women Voters, a group that evolved from the National American Woman Suffrage Association and was founded only months before the 19th Amendment was passed, reminds everyone that the best way to mark Women’s Equality Day is to register to vote. If you have any questions about your voter registration status, or if you need to register, find a polling place, or see a sample ballot, you can check online at the League’s affiliated website, Vote411.org. Originally posted on Daily Kos on Aug. 26, 2018.